Wood roof shingles are categorized according to their construction method, as traditional wood shingle, and modern wood roof shingle. In traditional method the nailing is done with hands, whereas, the modern technique involves nail guns. Traditional technique used for installation of wood shingles is good, compared to the modern method; in which required depth of the nail is not ensured. So an irregular depth can cause tightness in the shingles. Excellent quality shingles are those, which are taken from cedar trees, which are older and stronger. Wood roof shingles look natural and unique, as there is a variation of color, thickness and width. 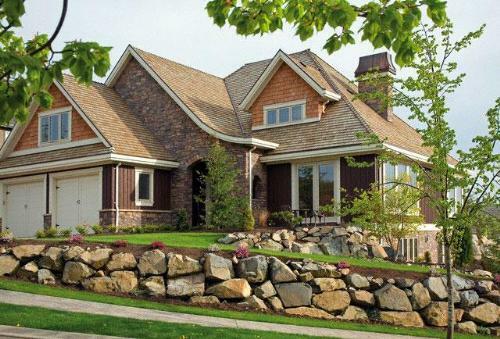 With Wood shingles, insulation becomes easy. Constant air circulation remains in the house, because of the openings thatare left in the felt, over which shingles are laid. Latest making involves the process of pressure treatments mixed with fire retardants, which ensures fire safety. More maintenance is required to increase the life of the wood roof shingles, as it is not long lasting in terms of insects, molds, and rot. As old shingles cannot be recycled, so the life cycle cost gets higher. They are not fire resistant, though some fire retardants are sprayed over them, but they work only for a few years. Special expertise is required to install wood roof shingles. Wood shingles divided into various types according to the tree from which wood is taken, and it includes cedar tree, pine, redwood, and a cypress tree. Besides, wood shingles vary in length ranging from 18 inches to 24 inches; whereas, someare tapered which is their natural quality. Colors of red cedar shingles are semi transparent including browns, beige, greens, whereas in white cedar shingles there are solid colors available, as various tones of green, grey, brown, white, red, peach, and black and many more. The price depends on the pitch of the roof, whether it is low or high, and is calculated by adding the material, and labor price. It includes $5.12 and $7.40 per sq.ft. It is 30 to 40 years, but it depends on weather, the quality of the wood, roof pitch, sun exposure and type of shade, as excess of sun can cause cracks in the wood, whereas an excess of shade can create moisture and rot. Wood roofing shingles are attached to a roof deck with stainless steel nails. Fasteners are used to attach the shingles, and nails should go deep into the material for a secure installation. Moreover,the nails hould go up to the lower side of the roof i.e.at least ¾ inch into board decks. Wood panels used should be fire resistant, and underlayment should be provided in the form of asphalt. Whereas in many cases an interlayment is also required in the form of felt paper. In icy areas, self-adhering polymer-modified bitumen membrane is used. This is applied starting from the roof eaves, and it goes up to a slope of 24 inches from the exterior wall. Four types of flashing are made in wood roofs, as penetrations, perimeters, vertical surfaces and valleys.